To celebrate its 23rd year in orbit, the NASA/ESA Hubble Space Telescope has released a stunning new image of one of the most distinctive objects in our skies: the Horsehead Nebula. This image shows the nebula in a whole new light, capturing plumes of gas in the infrared and revealing a beautiful, delicate structure that is normally obscured by dust. This year marks the 23rd year of observing for the Hubble Space Telescope. Alongside cutting-edge science, the orbiting observatory has produced countless stunning astronomical images. Some of the most striking and beautiful subjects of Hubble’s images have been nebulae — vast interstellar clouds of gas and dust. This new Hubble image, captured and released to celebrate this milestone, shows part of the sky in the constellation of Orion (The Hunter). Rising like a giant seahorse from turbulent waves of dust and gas is the Horsehead Nebula, otherwise known as Barnard 33. The nebula formed from a collapsing interstellar cloud of material, and glows as it is illuminated by a nearby hot star . The gas clouds surrounding the Horsehead have already dissipated, but the jutting pillar is made of stronger stuff — thick clumps of material — that is harder to erode. 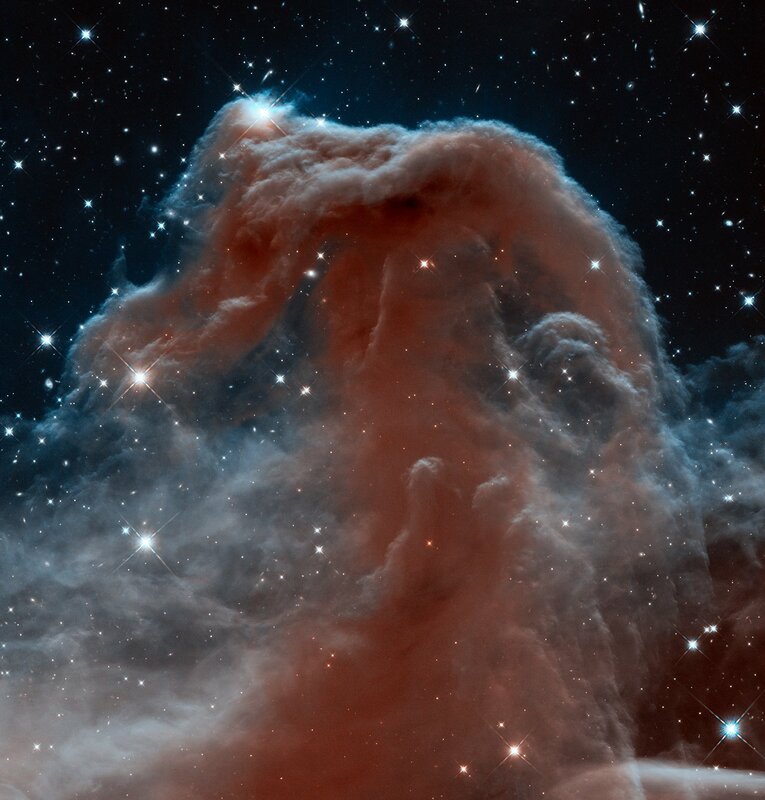 Astronomers estimate that the Horsehead formation has about five million years left before it too disintegrates. This nebula is a very well-known object and a popular target for observations, most of which show the Horsehead as a dark cloud silhouetted against a background of glowing gas. This new image shows the same region in infrared light, which has longer wavelengths than visible light and can pierce through the dusty material that usually obscures the nebula’s inner regions. The result is a rather ethereal and fragile-looking structure, made of delicate folds of gas — very different to the nebula’s appearance in visible light. We cannot see infrared radiation with our eyes or with standard cameras, which are designed to detect optical light. To observe these objects, we have infrared-sensitive telescopes or instruments — for example, Hubble’s high-resolution Wide Field Camera 3, fitted in 2009. Hubble’s pairing of infrared sensitivity and unparalleled resolution offers a tantalising hint of what we will be able to achieve with the upcoming James Webb Space Telescope, set for launch in 2018. 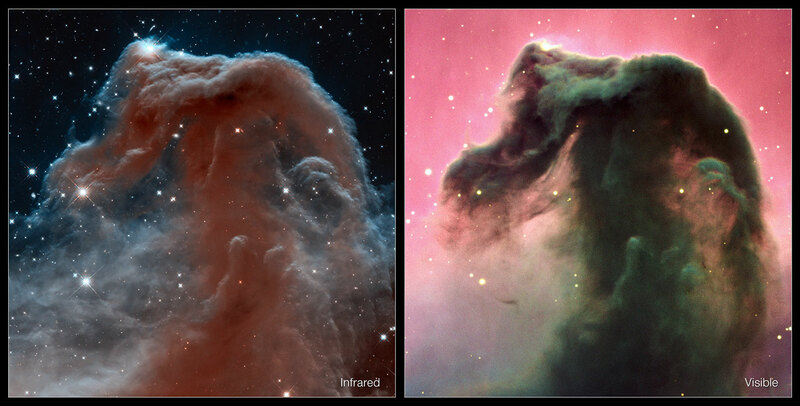 Hubble also imaged the Horsehead Nebula to celebrate its 11th year in orbit (heic0105). Some nebulae form in much more dramatic ways — like the Helix Nebula, the result of a once Sun-like star blowing off its outer layers, or the Crab Nebula, the remains of a massive star exploding as a supernova.